Column vol.07 - race | Yamaha Motor Co., Ltd.
"Big news! Honda is here and they've brought an incredible machine," shouted one of the Yamaha crew breathless as he ran into the team's half-set-up garage on the paddock at Monza the day before the start of the 1964 Italian GP. The Yamaha team was competing in the full World GP series for the first time this season, bringing with it a new powered-up version of the 2-stroke, 2-cylinder RD56 factory racer that Fumio Ito had piloted to Yamaha's first GP win the year before. After a slow start in the early going, the team got its first win at the French GP. That first win set fire to the team as they roared to four consecutive victories beginning with round six of the series, the Belgium GP, and clinched their first Manufacture's title. Spirits were high, then, as they rolled into Monza for the Italian GP. The performances of the team's new British rider, Phil Read, were nothing less than spectacular. He already had four wins on the season. Last year's champion, Honda's Redman stood 2nd in the ranking with two wins to his credit, but with the championship being decided by the points from each rider's best six races, Read only needed one more win to clinch the Rider title without waiting for the final round. Neither rider could afford to lose here at Monza. If Honda was here with a new machine it represented a serious challenge for the Yamaha team. Everyone rushed over to the Honda paddock to take a look, but the machine was completely hidden beneath a cover and the team could only get glimpses of it during the practice runs. All they knew was that it mounted a 4-stroke, 6-cylinder engine and had incredible speed on the straights. Monza was famous as a high-speed track, so everyone knew that if they fell behind they would probably never catch up with the Honda again. As a measure to deal with that speed, Read changed the gear settings to make 7th gear effectively an overdrive gear. His strategy was to get a good start to be clear of the confusion in the first corner and then fall in right on Redman's tail and stay there. Then he could use Redman's slipstream while he warmed up the engine and waited to make his move in the final stages of the race. At the all-important start, however, Read made a mistake and fell far behind. It looked as if he had lost his chance of victory, until the team realized that things weren't going as they had feared. Read was actually gaining on Redman gradually. 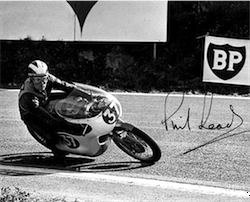 The Honda 6-cylinder was indeed fast on the straights but the RD56 was clearly faster through the turns. After Read realized that, it only took him seven laps to catch Redman and put his original strategy into action. Not only did he put the pressure on Redman by riding directly behind him, but at times he went past into the lead before dropping back to ride Redman's tail again. This tactic caused Redman to lose his rhythm and his machine to start losing power, due to the load its larger heat output. On the 22nd and final lap, Read made his last dash into the lead when he was sure that Redman's machine no longer had the power to pass him back. He went on to cross the finish triumphantly with a 10-second lead.